This article is excerpted from Healthy Aging® Magazine. To continue reading this article and more like it, subscribe to Healthy Aging® Magazine, the lifestyle magazine that is all about following your passion and what you can do rather than what you can’t. For many people, hearing the words “vegetarian diet” brings on a cold sweat. Meat-free diets, or at least, diets that actively encourage more vegetable consumption, tend to have a bad reputation. In a society that expects a serving of meat in each entrée and features a McDonald’s on every street corner, it might seem inconceivable that people could live their entire lives eating mostly plants. But the truth is that it’s absolutely possible and, most important of all, actually doable. Whether you’re going all the way with a strict vegan diet or simply want to lessen the amount of meat you’re eating, there are a whole bunch of benefits to enjoy by taking a step toward plants—no matter how small or large it is. You don’t have to cut yourself off from animal products entirely. Although a completely vegan diet is widely seen as the healthiest option, no one can deny that it takes a lot of commitment and discipline to follow it faithfully. Instead, vegetarian diets actually cover a wide spectrum that can suit anybody’s needs and desires. The more traditional vegetarians are the ones who cut out all meat, poultry, and fish. Some go a step further and exclude dairy and eggs, as well. Then, there are the strictest vegetarians of all: vegans. They completely cut out animal products from their diets, all the way from meat and poultry to milk and even honey. There are also more relaxed vegetarian diets. Pescatarians still allow fish, though not any other meats. Pollotarians are very similar, but they allow poultry instead. Going out even further are the semi-vegetarians, or flexitarians. Their diets largely consist of plants but allow for eating meat on occasion or on a regular basis in very small quantities. You could only make a few tiny adjustments. Meatless substitutes have been on the rise, especially within the last 10 to 15 years. It used to be a huge struggle to find somewhere that offered a veggie burger, but now, many restaurants will eagerly substitute one in at no additional cost. You can still order and enjoy the hamburger that you crave but instead with the added benefit of a healthier patty. Soy-based vegetarian and vegan hamburger patties contain none of those unhealthy animal fats that put so many people at risk. Best of all, the quality of these meatless substitutes has achieved higher and higher peaks. The texture and taste of these pseudo-meat products have become so close to the genuine meats they’re mimicking that many people can’t even tell the difference. But if these soy products aren’t to your liking, there are plenty of other easy ways to include less meat in your diet without making you completely overhaul your kitchen. Next time you’re making an entrée, see if you can substitute beans or tofu in place of the meat. That one simple adjustment is usually all it takes to make a meal vegetarian-friendly. And who knows? You might even like the new recipe better! 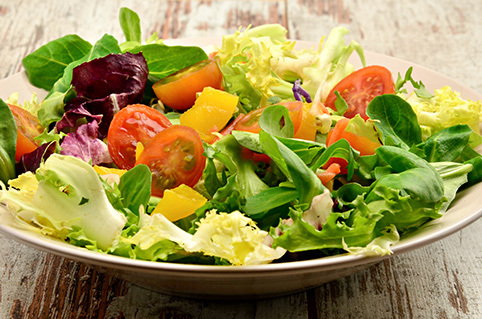 Why Not Give Vegetarian Diet a Try? 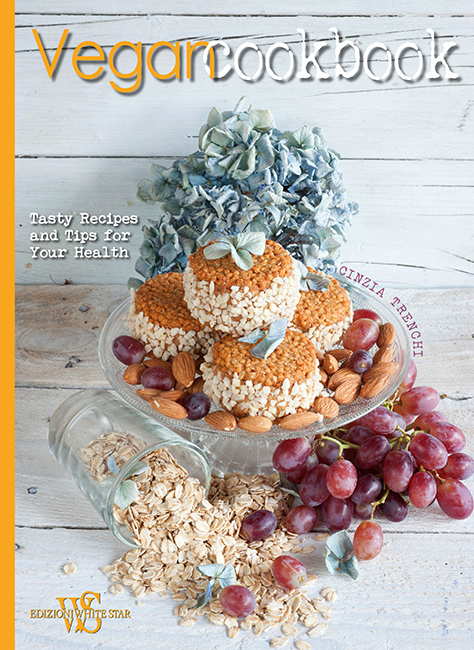 Cinzia Trenchi’s Vegan Cookbook: Tasty Recipes and Tips for Your Health is full of delicious, meat-free recipes that are absolutely bursting with nutrients. From savory entrées to mouthwatering desserts, these guilt-free foods are made from all sorts of healthy ingredients. And they taste amazing, too! Her cookbook is a great source of information for anyone who wants to learn more about vegan diets. Maybe you’re thinking about making that change for yourself. Or maybe you just want some quick and easy recipes to cut back on the meat in your diet. Either way, this cookbook offers all sorts of interesting tips and bits of information to go along with the recipes. It’s broken down into four broad categories: grains, legumes, vegetables, and also fruits and flours. These groups make up the backbone of a healthy vegan diet. Each section contains a bunch of different recipes that appeal to a variety of tastes, like a sweet Strawberry and Banana Strudel or her Spicy Wheat Berry Pie. She also has a quick, yet detailed, guide to many of the ingredients that go into these recipes—from seitan to white rice and kumquats. Pre-heat the oven to 400 degrees F. Cut the vegetables and orange rind into strips and roast until crispy. Wash the two types of rice separately and boil covered, still separately, for 10 minutes in double their volume of water. Turn off and leave to stand for 30 minutes, after which the grains should be cooked and the water completely absorbed. Put the red rice in a bowl and season with oil, and salt and pepper to taste. Put the brown rice in another bowl and add the cream, paprika and salt and pepper to taste. Mix well. 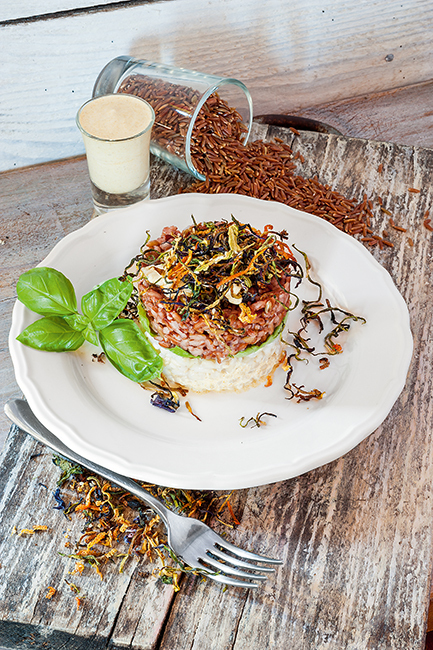 When preparing the food on the plate, use a ring to help you: create the first layer with white rice, decorate with 3 basil leaves and add a second layer of red rice. Decorate with the crunchy vegetables and serve. Reprinted with permission from Sterling Epicure. Vegan Cookbook. Text and Photos by Cinzia Trenchi. Another delicious recipe to try is this one from Ancient Harvest. Cook quinoa according to package instructions. Add dressing ingredients into a jar and shake well. Set aside. Heat oil in a large skillet over medium heat. 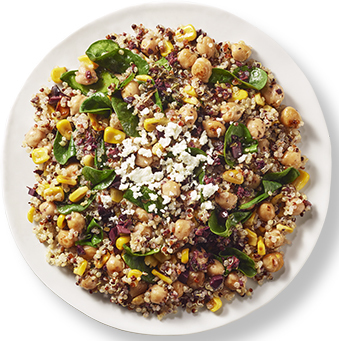 Add corn and chickpeas and cook for 5-7 minutes. Stir frequently. Stir in spinach for 2-3 minutes, until wilted. Stir in quinoa. Add desired amount of dressing and stir until fully coated. Season with salt and pepper to taste. Top with goat cheese or feta. Reprinted with permission from Ancient Harvest. Yellow Table Cookbook Serves Up Healthy and Creative Recipes Seaweed Might Help Fight Food Allergies New Year’s Diet…Which One is Right for You? Cookbook Review: Dr. Oz’s Latest Just Eat fish? Then You Are a Seagan!